I love politics. One of my basic rules of life is "Always allow (or possibly even encourage) idiots to self-identify." In general I agree with most of the main points, but a few quibbles. "People should speak literal, measured truth or be silent." There are vast oceans between hyperbole and literal, measured truth. And in many important areas, there is no literal, measured truth to be had. "People should describe reality as it is, not pander to wishful thinking." Agreed in principle. In practice, it's not so easy to tell who's describing reality as it is and who is engaging in wishful thinking. There is also at least some gap in the middle where it's not quite reality as it is and not so far from reality as it is as to be wishful thinking. "I hate the innumeracy of politics. People should focus on what's quantitatively important, not what thrills the masses." I agree on the first sentence, but it's also important to avoid hypernumeracy. Hypernumeracy is a false belief that everything is quantifiable. Not everything that matters is quantifiable and qualitative differences can also matter without amounting to "what thrills the masses". "I agree on the first sentence, but it's also important to avoid hypernumeracy. Hypernumeracy is a false belief that everything is quantifiable. Not everything that matters is quantifiable and qualitative differences can also matter without amounting to 'what thrills the masses.'" Yup. The acknowledgement of this is what sets Austrian Economics apart from the other schools of thought. A better way of putting it would be that all value is subjective, and it seems that the main goal of politics is to impose the values of one group (because their values are "obviously right" and everyone who disagrees with them is an inbred hillbilly moron or a useless academic or whatever) on the "wrong" people in order to "save" them. i hate the coercive, collectivist nature of politics. once, a government was deemed just in the US if its goal was preventing people and government alike from doing thing to the citizens that the citizens did not want.. this mattered at the individual level, not the collective one. no matter how much 3 people wanted to take your money and spend it, absent your permission, they could not do so. now, a self described "just government" panders to the collective by coercively taking from a few to give to the rest. gone is any notion of justice stemming from protecting the individual. it's now about satiating the thirst of the majority to, as mencken so aptly put it, turn each election into "an advance auction on stolen goods" or in many cases, good to be stolen later. the politics of calling such "legal plunder" (in the bastiat sense) "social justice" is just misnaming tyranny of the majority service to society. Many, many people live a state centered life. Everything in their world revolves around the state-by their own choice. If everything in a persons life revolves around the state-then everything the state does takes on the air of a moral crusade. That, to me, is dangerous and disgusting. And that is what makes politics so gross. Whenever I have advocated voting for the lesser evil I have been disparaged as a disgraceful cynic. But only, as far as I can tell, by Americans. Is this because the office of President elevates a politician to a demigod? The sad thing is that it's usually not even a majority - just some group that wormed its way into the halls of power and managed to drag its agenda through. I think Ayn Rand nailed it with "the aristocracy of pull." Personal savior? You are overinterpreting the meaning of a bumper sticker! 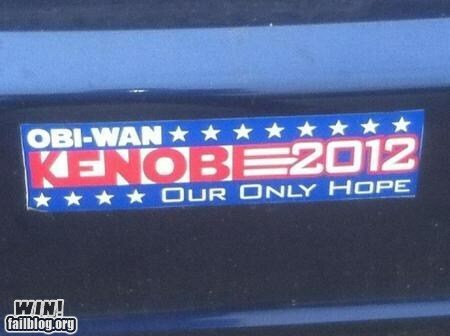 I have been known to put a sticker with the name of a favorite candidate on my car, to show support. That means nothing other than the fact that I prefer that candidate over the alternative. I have a Gary Johnson bumper sticker and a Libertarian Party bumper sticker in the back window of my car. It's not attached because things and people change and should that time come can reach in and throw them away. Politics are built in to all brains, human and animal. Politics are how animals interact. You might reread Aristotle on this. Lying, cheating, stealing, nepotism, favoritism ... are all part of the process, and it is simply delusional to think a human society is possible without them. Even animals try to deceive one another. It is somewhat like bureaucracy. A bureaucracy is simply civilization itself. "Lying, cheating, stealing, nepotism, favoritism ... are all part of the process, and it is simply delusional to think a human society is possible without them." The people who created our government appear to have understood this, which is why they attempted to limit the power the government was able to exercise over the people. Turns out, they weren't all that successful. Totally amazed no one is talking about Obama's UN speech. How could we not? Followed the long term Open Society agenda. Open borders changed to global integration.